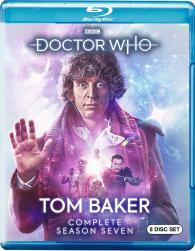 Re-discover seven classic adventures from Tom Baker's s final year as the much-loved Fourth Doctor. In these twenty nine episodes, the Doctor and his companions encounter the Foamasi, Meglos, the Marshmen, vampires and Tharils, building to a final deadly showdown between the Doctor and his arch nemesis, the Master. Each episode has been brilliantly restored for Blu-ray and comes with in-depth special features, both old and new.